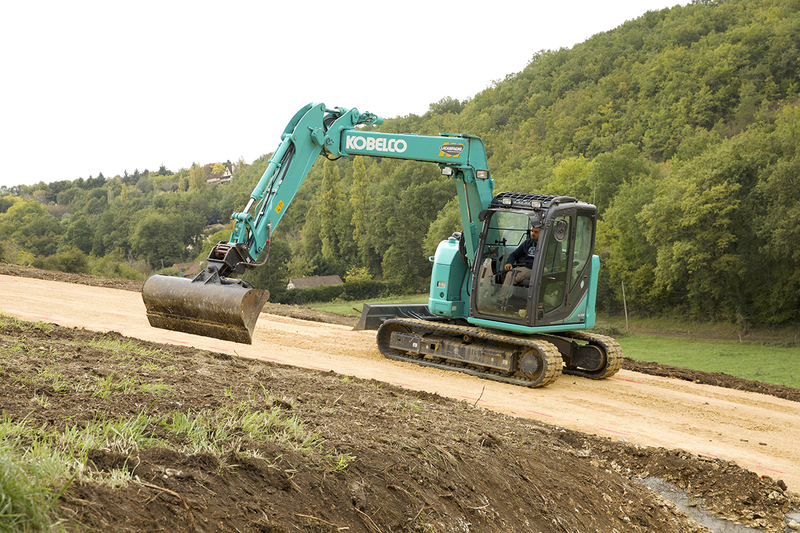 Benjamin Davido - Kobelco Construction Machinery Europe B.V. Deep in the Dordogne, southwestern France, the air is filled with natural smells from rolling countryside and the thousands of trees on the hillsides. This natural splendour stretches as far as the eye can see. The only sign of man is the occasional rooftops of century-old chateaus and farming communities. Despite the calm and natural beauty there is a massive daily and very necessary production event involving grass, cows and milking machines. Milk farming is a vital aspect of today’s world. The herds of cattle quietly going about their daily lives, strolling across meadows and eating grass are actually integral to the way we live. How many lives would be affected if we couldn’t have milk for that all-important morning coffee or tea; our breakfast cereals; and foodstuffs that require milk? To collect daily milk production from the farming regions, milk tankers are used. These collection vehicles are getting bigger in order to spread their collection range and reduce costs. The problem is many of the rural farmland roads aren’t accessible to these huge tankers. One such company that specialises in widening, reinforcing and construction of new roads for nearly 60 years is Cypriote Travaux Publics. 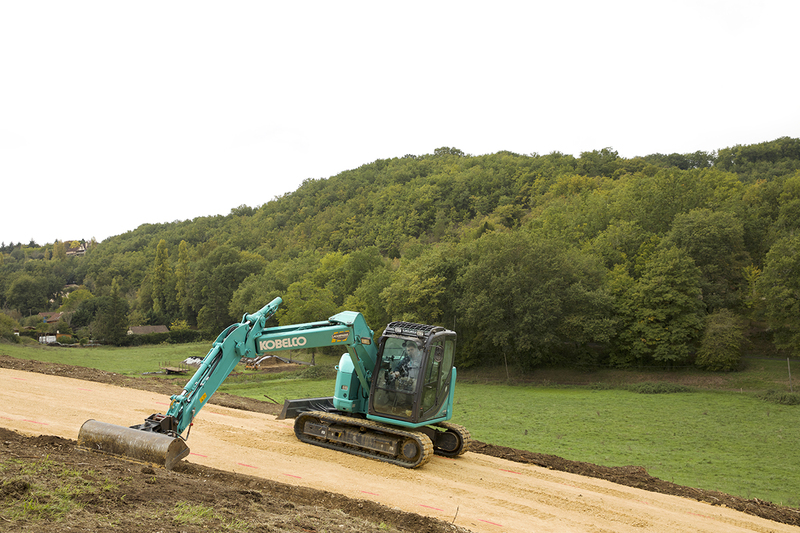 One of its projects is the reconstruction of an access road from the D25 main road to a farm that produces approximately 500,000 litres of milk per year. 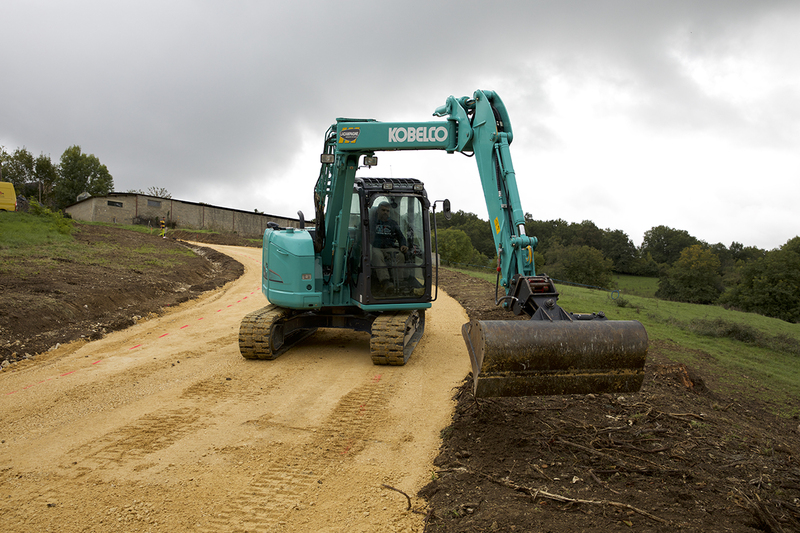 The Kobelco excavator on site is a SK75SR-3, the latest addition to the company’s excavator fleet that also includes a SK260NLC-9, SK135 and SK35. 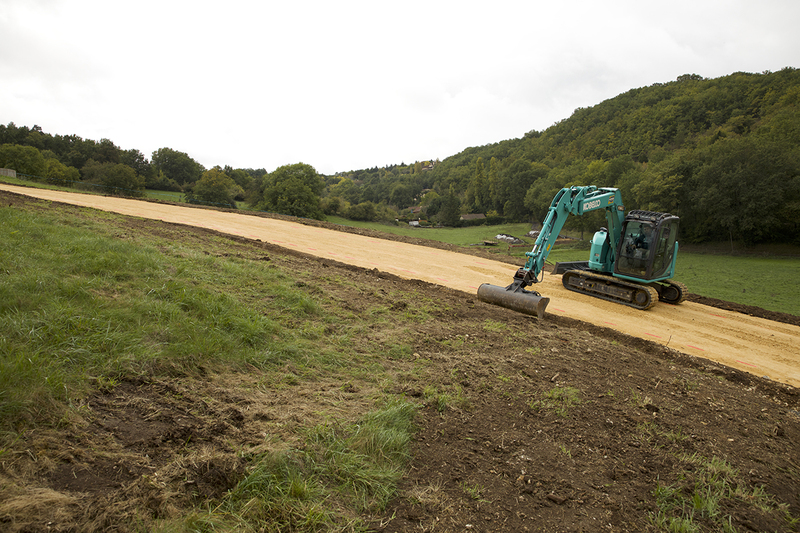 It’s obvious why the new access road to this milk production farm has to be constructed. The original single track road is narrow, features tight S-bends and runs steeply uphill, or downhill depending on your direction. 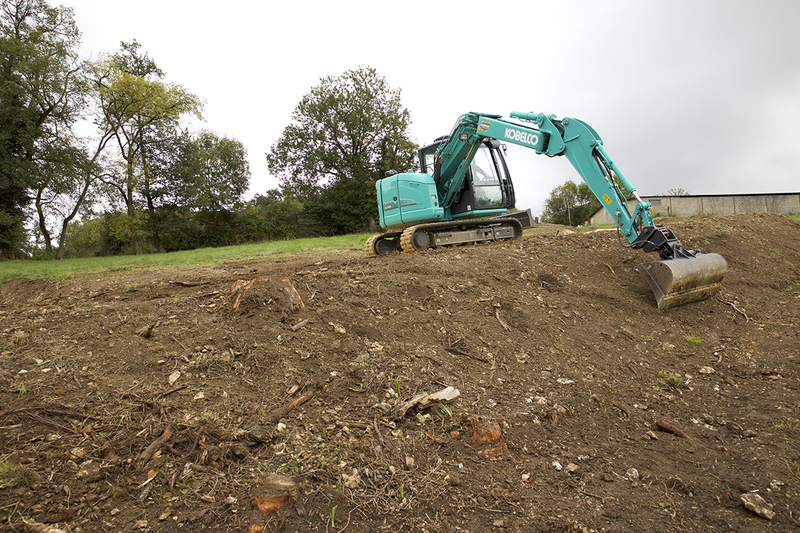 Benjamin’s five years in construction has always been at the controls of excavators or skidsteer machines. 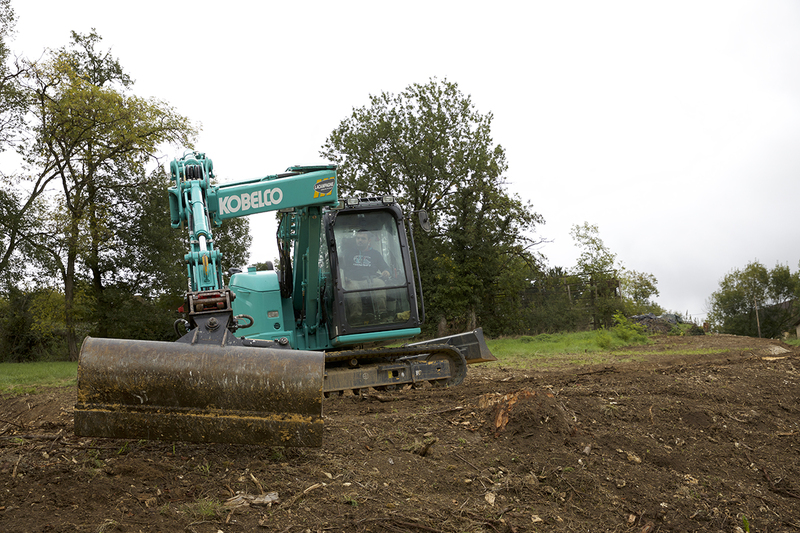 His Kobelco experience includes operating an SK135 and now, for nearly a year, the SK75SR-3. 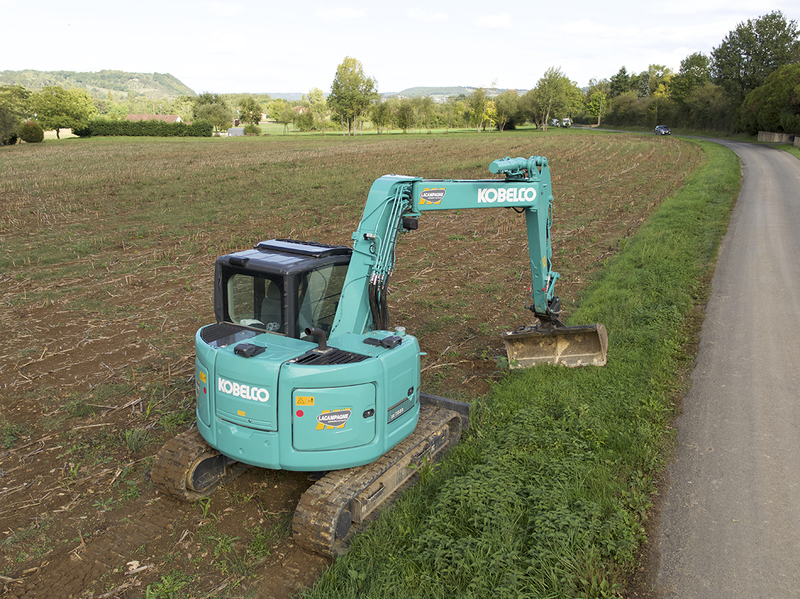 Each work day consists of seven-to-eight hours operating the SK75SR-3. “The machine is very comfortable – perhaps one of the best for comfort,” continues Benjamin. “With the radio on it’s an ideal work place. Because the maximum temperature is around 35°C in the summer, the air-conditioning is needed and this has worked very consistently at 22°C. Backed up with high-lifting capacity and exceptional centre of gravity, this midi-excavator can be used for a variety of tasks. 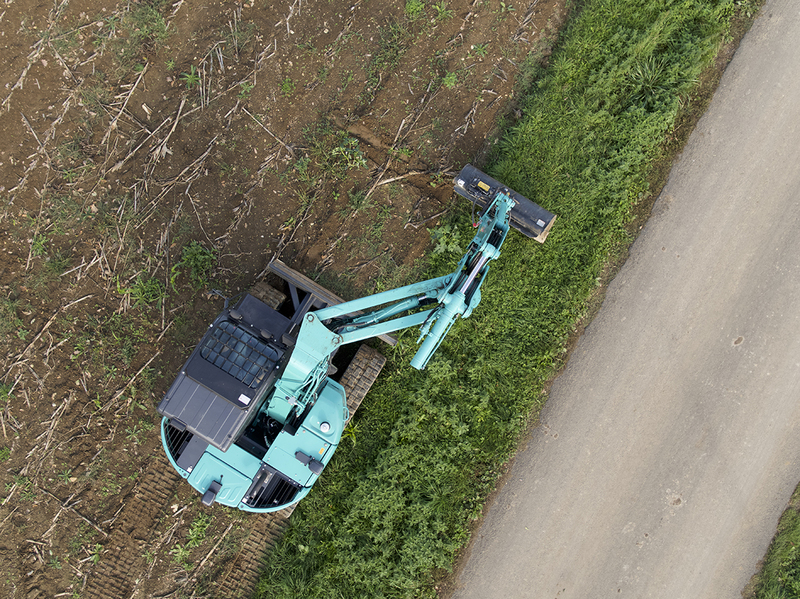 There is also capability to pre-set the SK75SR-3’s boom height and dig depth limits for overhead cable and drain/underground cable avoidance; both are important safety features, as is the auto-stop optical collision system when dozing.